Crude oil has been on a decline for last few weeks and now the decline seems to be coming to an end. Talks of OPEC holding back output in an effort to balance the market while sanctions against Venezuela and Iran have worked to keep supplies tight. The price too is attempting to stage a comeback over last few weeks but with limited interest. 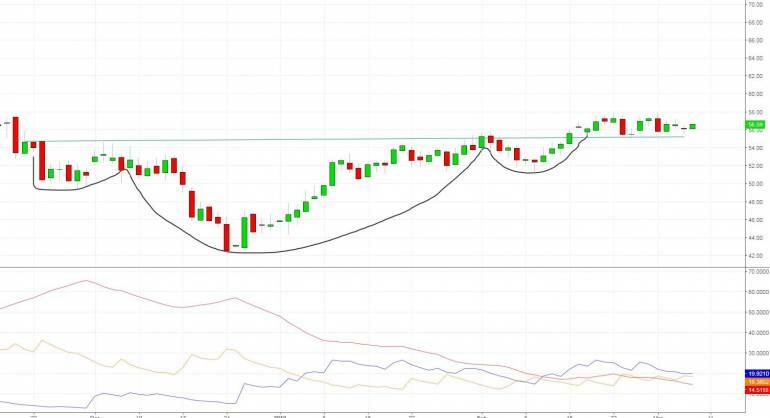 In the charts, I have highlighted Inverted Head and Shoulder pattern. The breakout has emerged over 56 levels and the levels are sustaining over the past few days indicating that we could be looking at some potential run to the upside. Further, the +DI line seems to be inclined to head higher and those trading in commodity space can track the crude oil as a move above 58 could augur some positive traction for this commodity. In line with the view, the Cup and Handle pattern did make an impact, pushing crude oil prices ahead. The resultant upbeat moves seen on WTI Crude suggests that we could expect the energy sector to be in play today. We once again drill down into the daily charts and we observe that the move past 58 as anticipated has emerged and rather quite resolutely stating that crude oil is not done yet. With no interest to slow down, we could experience some fresh upward momentum here. On the prices, we are observing a Bollinger band tagging, accompanied by a follow through. To aid the upside, we also have a fresh signal in the MACD, that clearly suggests that we are headed for some bullish moves. Positive news reports emanating from Saudi Arabia along with a possible deal between US-China trade deal for oil and gas could assist the sustenance of the momentum. Mixed news reports shall continue to emerge. However, one can consider initiating some trades in crude oil as the momentum seems to be on the bullish side. With macro factors too indicating that pessimism is reducing, it could help the prices garner more support for some buying.